Here is another much-needed, new item. 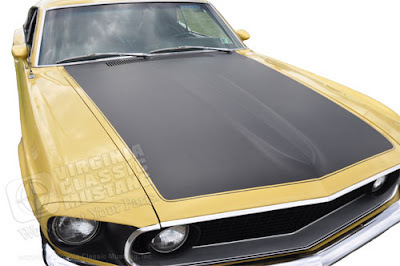 It is the paint stencil kit for "blacking out" the hood on a '69 Mustang Mach 1 and '69 Boss 302. This kit is precision cut using high quality paint masking/stencil material. Order part number ER1661. New Virginia Classic Mustang Web Site! !